This one isn't indigenous to anywhere except perhaps the Realm of Whimsy, but it sure is outside the western boatbuilding tradition. 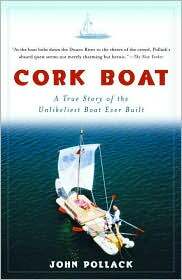 Cork Boat: A True Story of the Unlikeliest Boat Ever Built , by John Pollack, is a fun little book about one man's "dream" to build a boat entirely out of wine corks. Pollack first had the idea at the age of five or so, after his first attempt at building a displacement boat failed. Figuring that a boat made out of corks couldn't sink, he began collecting them, aided by his family. As he reached adulthood, he was still collecting corks, but the dream had become quite remote -- just something to think about, and likely never really do. Pollack worked as a speechwriter for David Bonior, the Democratic Whip in the U.S. House of Representatives. But disillusioned by the nastiness and futility of politics in general, he quit his job and began to focus on the cork boat as a kind of therapy. The notion of devoting himself to something whimsical appealed to him and enabled him to turn his mind away from the dispiriting nature of national politics. He spread a wide net, asking restaurants around D.C. to save corks for him. He joined up with an architect friend who helped him design the boat and agreed to crew with him, although no particular trip or voyage had been discussed. After months of collecting, they realized that they weren't even close to the hundreds of thousands of corks required. They sought, and most amazingly, found the perfect sponsor in a company called Cork Supply Group, which distributes corks to wine makers all over the world. CSG ultimately supplied hundreds of thousands of corks in exchange for sponsorship. They went further, providing generous financial backing that was probably all out of proportion to the promotional value of the arrangement (which was, however, substantial). Like Pollack, it seems that the folks at CSG just thought the idea of a cork boat was really cool, and they wanted to help out. Pollack briefly came out of "retirement" when he had an opportunity to work in the Clinton White House but, even there, he continued collecting corks and building the boat in his spare time. After the Supreme Court's dubious resolution of the Bush/Gore presidential race, followed not long after by the 9/11 terrorist attacks, Pollack's disillusion with politics was complete, and he turned his sole attention back to his project, with renewed vigor. 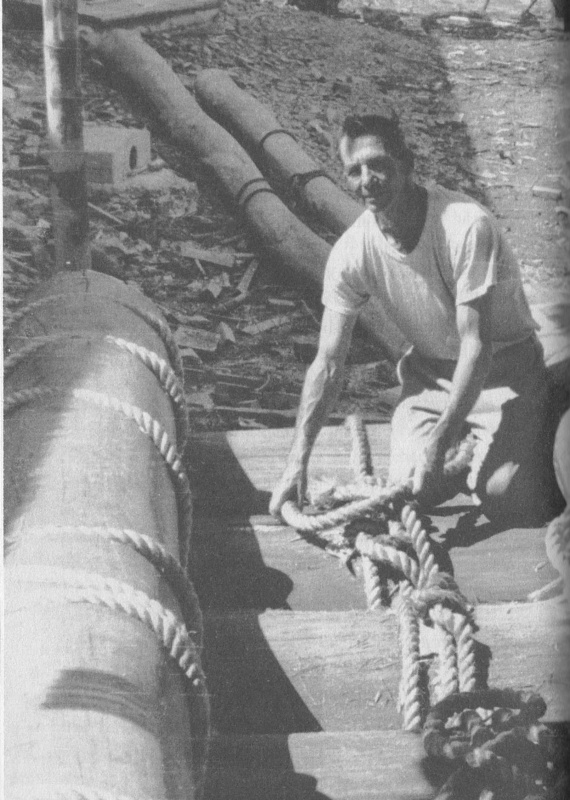 Pollack's greatest skill was that of organizer, and he persuaded dozens of people -- friends, relatives, and strangers -- to help him with the phenomenally tedious process of assembling the boat. (See below for details.) When complete, it was shipped to Portugal (home to Cork Supply Group), then trucked up the Douro River to the Spanish border and launched. Over the course of about three weeks, Pollack, his architect friend, and a revolving crew of friends and family descended the Douro, mainly rowing and occasionally sailing down to Porto on the coast. Building the boat takes up most of the book, and it's unfortunate for we boaties, but probably better for most readers, that Pollack doesn't give much detail on the boat's design, and provides little in the way of illustrations. (The image above is the only one of the boat itself, other than the photo on the book's jacket.) It was, of course, a raft, not a true boat. The basic unit of construction was a hexagonal "disk" formed by bundling 127 corks together with long rubber bands. Dozens of these hexagons were stacked and sewn together inside a tubular net to create "logs." Nine logs were lashed together, four above five, with the front ends curving sharply upward in what the author imagined to look like a Viking ship. (It actually looked much more like a reed boat, which it also more closely resembled in its hydrodynamic properties.) Decks were added, along with two sets of oarlocks, a centerboard, rudder, mast step, and mast hoisting a square sail. It's a cute book about an "adventure" that's neither harrowing nor grand. The whole idea was to do something offbeat and personal, something based on a private inspiration of no real social significance. As it turned out, the boat and the adventure did generate a number of pleasant social encounters for the author, and he took heart in the power of a silly but pleasant idea to bring out the best in people. Occasionally, Pollack veers a bit close to oversentimentality, but he seems like a sincere and likable fellow, and he's easily excused. Since few of us read much academic literature, and even fewer read the literature of more than one field of interest, our views of the distant past are necessarily colored by the interpretations of experts who do. Where experts agree, and where their interpretations have been promulgated in popular literature or other media, our views may be about as accurate as those of the experts', albeit considerably less nuanced and detailed. But sometimes, even the experts' best guesses can be wrong: for example, tyrannosaurus rex used to be depicted with an upright posture, based on the consensus view of paleontologists. But with more research, that view changed, and the consensus is now for a more birdlike posture, with the torso held horizontal. The new consensus has been sufficiently popularized so that anyone under the age of 30 or so probably pictures the "new" version of the beast while, for some of us over 50, it's hard to shake the image of the upright t.rex we knew and loved in our youth. Where the experts disagree with one another, however, we non-experts are left to choose among competing visions based on incomplete evidence. Obviously, the experts' evidence is incomplete too, or they would not be in disagreement. But at least they're disagreeing on the interpretation of the best available evidence, while we non-experts can only guess at who's right based on a fraction of the available evidence and, more likely, on which expert's argument is more persuasive to our untutored intellects. 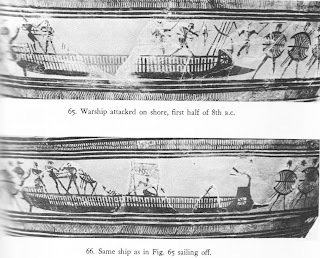 That's why it's hard (for me, at least) to choose between two different interpretations of Greek warships of the 8th century BC, by Lionel Casson (in Ships and Seamanship in the Ancient World ) and Bjorn Landstrom (in The Ship: An Illustrated History ). This was the period when the Iliad and the Odyssey were first written down. When Homer's epics were composed for oral recitation is a matter of dispute, however. Some believe it may have been only 50 years or so before they were committed to writing; others think it was much closer to the time of the events they describe: some 400 years earlier. In any case, we'll be looking here at the graphic evidence for the vessels from the 8th century BC. Whether that graphic evidence was an accurate depiction of the vessels of Homer's time (whenever that was), and whether Homer was accurate in his descriptions of the vessels of Odysseus's time, are both different questions. 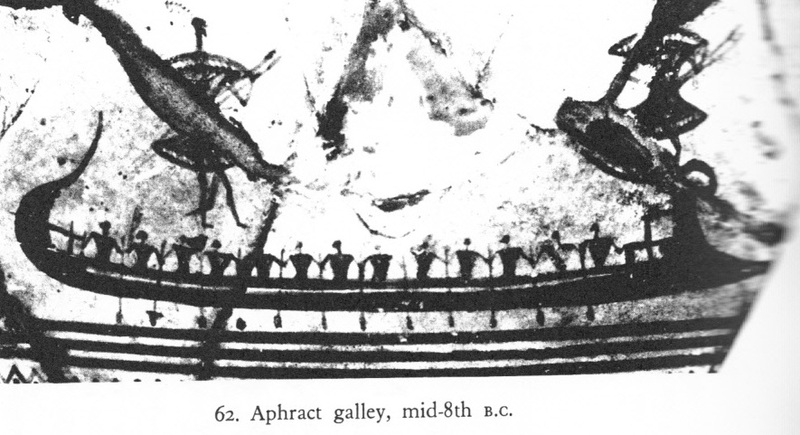 Casson describes the aphract as a vessel with a single bank of rowers, based on painted images on pottery like the one below, labelled "Casson #1." 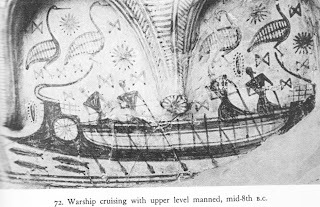 Note the ram bow, the small platforms in the bow and stern, and especially the structure between the ram and the bow platform. This appears to be a shield for a warrior on the platform, and perhaps it is also meant to deflect spray from the rowers. The raised stern would seem to perform the same functions. Although it is obscured, there appears to be a horn-like decoration mounted atop the bow "shield." Note also the white band that runs horizontally beneath the rowers -- we'll address this detail below. 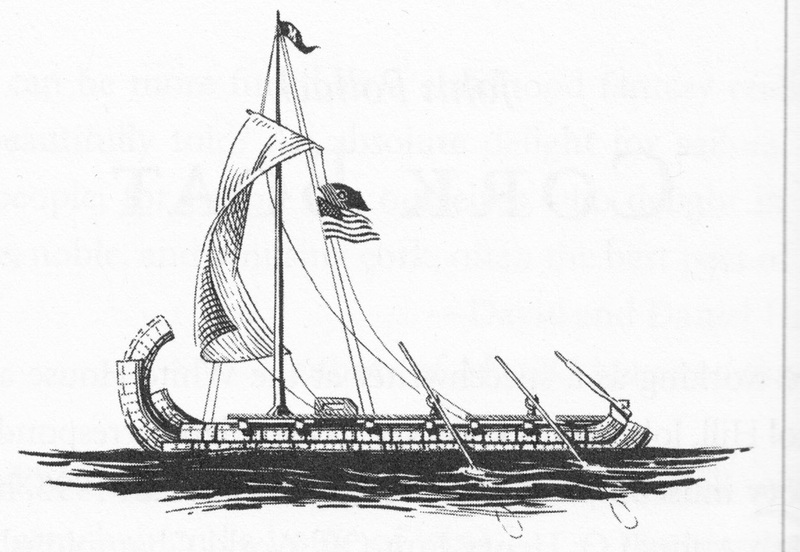 Greek galley, from Landstrom. 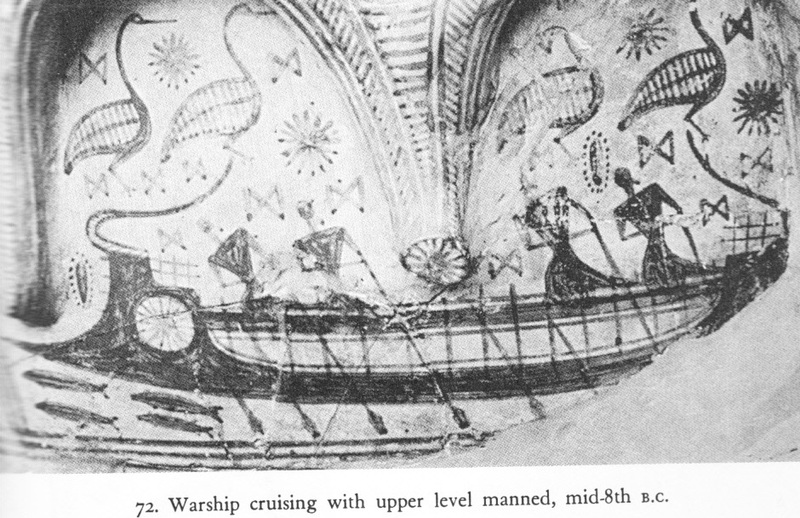 This dugout-based boat seems to logically interpret every feature of the aphract pictured on the pottery fragment in Casson #1 above. Note that Landstrom's vessel, while lovely and undoubtedly fast, could not possibly be a seagoing ship. It is clearly a boat suited only for the most protected waters. 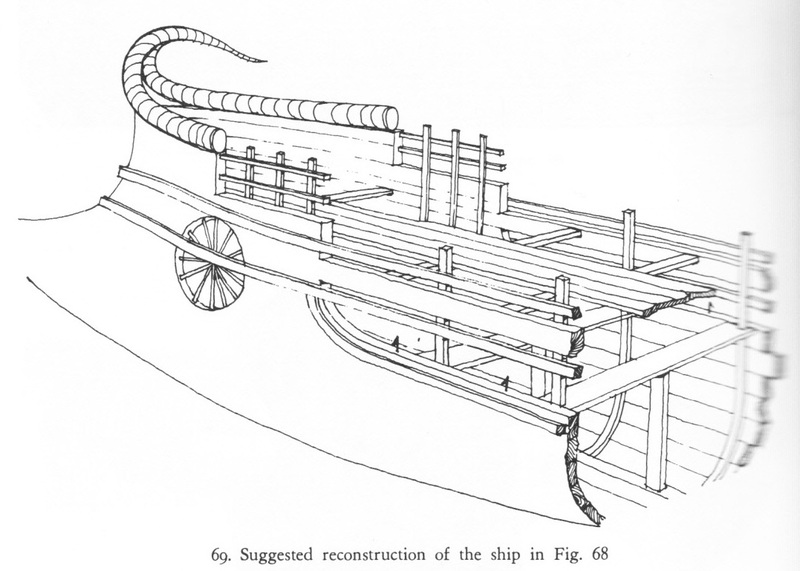 But the oddest thng is that Landstrom's illustration was based on Greek originals that, though similar to the aphract pictured in Casson #1 in many respects, were apparently more substantial vessels. See the illustration below labeled Casson #4. Casson interprets this illustration as a two-banked warship -- i.e., one with rowers on two levels. Landstrom, in contrast, insists that it is a single vessel with two lines of rowers -- i.e., two rowers per thwart, sitting side by side. A third interpretation is possible: that Casson #4 represents two vessels side by side, seen overlapping in perspective. I make this interpretation based on what clearly (to me) appears to be two bow rams. If my interpretation is correct, then I do not think that the arrangement of rowers in the two boats can be definitively interpreted. While the artist may be showing an early use of perspective (although Landstrom says that this technique was not known at this time), he is almost certainly not attempting to depict such details as rowing arrangements with literal accuracy. 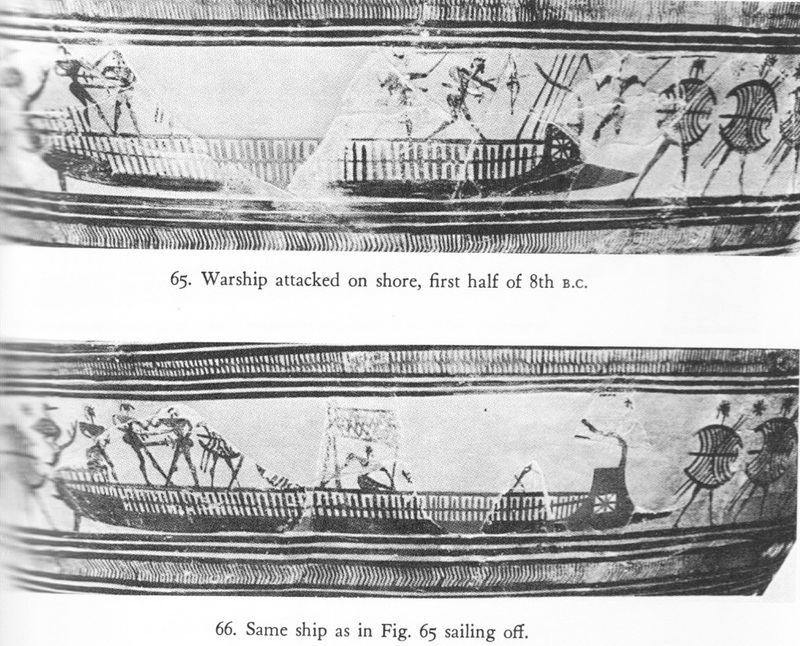 Casson #2: Warship ashore; two views on the same piece of pottery. Casson #4: "two banked warship"
Casson believes that Casson #2, above represents a decked vessel, and that rowers would have sat below the deck. (Oars are not in evidence because the vessel is beached.) But while the presence of a deck seems clear, the black hull is virtually unchanged from Casson #1. 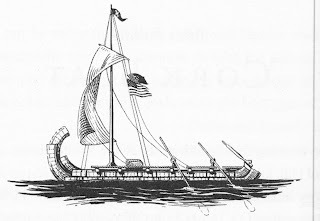 Is it possible that, rather than a deck/platform, the grid of fine lines above the black hull represents rowing outriggers as shown in Landstrom's illustration? Casson #3 represents, in Casson's view, a two-banked warship, with rowers shown on the top level only. The broad white area between the main hull and the level on which the rowers are shown would appear to represent a lower bank where more rowers might be seated -- perhaps during a sea battle, leaving the upper level free for combat, and protecting the rowers from missiles. But if we interpret the broad white band as a lower level, then what do we make of the narrow white band in Casson #1? In Casson #5 below are two more images showing, in Casson's interpretation, the bows of two-banked galleys. Graphically, these are still very similar in most respects to Casson #1, (showing the same ram, "shield," horn ornament, and overall hull shape) but Casson interprets them as quite different vessels; biremes with semi-enclosed rowing cabins vs. open single-banked vessels. Casson #5: Note: i) the horns mounted on the bow shield, ii) the round, "spoked" decoration on the bow shield, and iii) the apparent presence of an upper deck, i.e., two banks of oars..
Casson #6: reconstruction of an 8th Century BC bireme: a true warship with two banks of rowers. Casson's and Landstrom's interpretations couldn't be more different. Landstrom's is a dugout canoe -- a simple boat not even extended vertically with the addition of washstrakes. 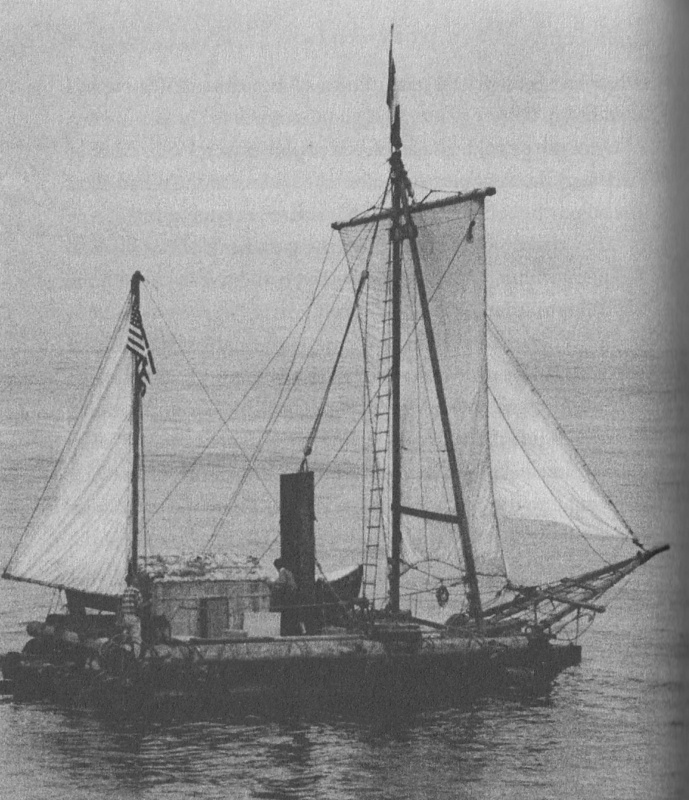 Casson's is a full-fledged, sea-going ship, built plank-on-frame, with an upper deck consisting of a fighting platform that runs the length of the vessel amidships, and thwarts to each side of it, upon which a second bank of rowers could sit in good weather or anytime when not engaged in battle. There may be a keelson, but it is very slight, and two wales have been added for longitudinal strength. Note how the round, spoked decoration -- merely painted on in Landstrom's version -- is a large hole pierced through the otherwise solid timber bow, with actual spokes added for decoration. 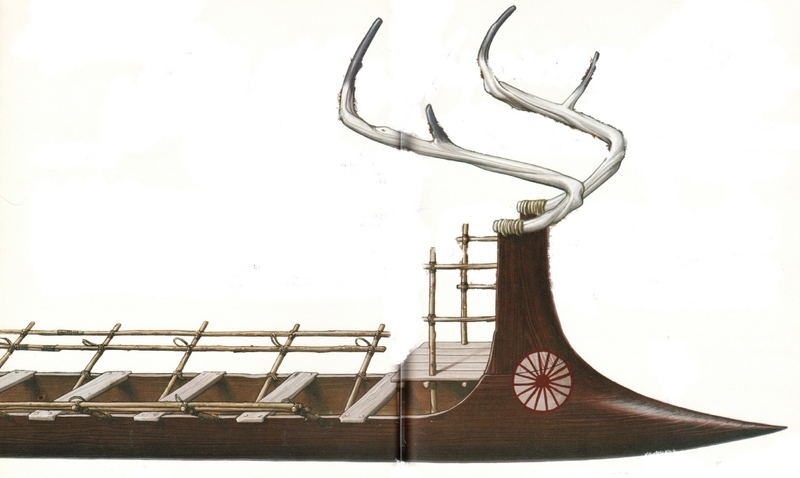 The horns -- actual antlers on Landstrom's dugout -- are probably fabrications on Casson's vessel meant to represent (immensely oversized) animal horns. I doubt they would be real elephant tusks, for their presence in the illustrations is too consistent while elephant tusks would, I presume, have been extremely rare in 8th century BC Greece. 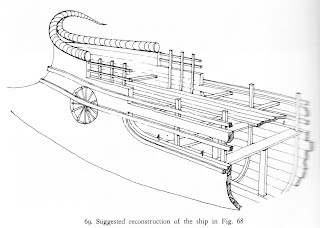 The plank-built ship of Casson's interpretation is obviously more capable than Landstrom's dugout canoe of having crossed the Aegean Sea to make war on Troy. But there is a grace to Landstrom's illustration of a fast dugout that is so appealing that one hesitates to reject it entirely. Among its many flaws, The Chinese Sailing Rig - Design and Build Your Own Junk Rig by Derek Van Loan suffers from an identity crisis. It appears to be known primarily by its subtitle, and on the front cover, the subtitle is far more prominent than the main title (and on the spine, the main title doesn't appear at all). 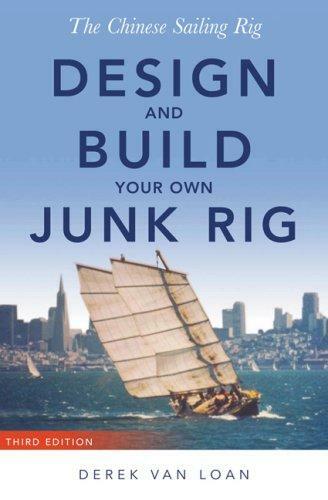 In fact, "Design and Build Your Own Junk Rig" is a more accurate title than "The Chinese Sailing Rig," but even then, it's a stretch, which I'll get to. Van Loan says virtually nothing about the Chinese sailing rig -- nothing about its history, nothing about its current usage, next to nothing about how to sail it and, most seriously, nothing whatsoever about its pros and cons compared to Western rigs like the Marconi, gaff, etc. He seems to assume that the reader is already persuaded about the superiority of the junk rig and is ready to retrofit an existing non-junk-rigged boat with one -- and that he or she only needs to know how. The number of battens is dependent on the sail area. Up to 200 square feet, four or five battens will suffice. Use five or six battens on a sail where the area is from 200 to 700 square feet. As to why you should use fewer or more battens, he gives no explanation. Following his guidelines, one could use anywhere from four to six battens for a 200 square foot sail, but Van Loan doesn't give any help in deciding what is the right number within a range that contains a full 50 percent spread. Oh great: "about one third". Perhaps if he had explained in the first place how to calculate area, we might be able to make a start. But even so, how precise do we need to be to meet his "about" one-third guideline? Is 30% too little? How about 25%? Don't bother looking, for there's no help to be found. By eliminating theory and math, Van Loan has attempted to make things as simple as possible, but therein lies the problem: he gives the reader not enough information upon which to make informed decisions. And then he compounds the problem by assuming specialized knowledge that the reader is unlikely to have, especially sailmaker's and rigger's terminology. The glossary is only occasionally helpful, consisting mainly of the better-known terms, and ignoring some of the more obscure ones. Van Loan's line drawings are clear and good, and his prose is generally easy to follow. If one were to follow the book's recommendations, one would probably end up with a workable -- maybe even a very good -- rig. But that rig would be based more or less blindly on someone else's preferences, and the DIY'er would have little understanding of why it works the way it does, or how it might be improved. "Design and Build Your Own Junk Rig" is full of editing errors, lacking in theory, and inadequate in its discussion of the author's particular preferences. For a book in its third edition, it's a notably weak effort. William Willis building Seven Little Sisters. Thor Heyerdahl's world-famous Kon Tiki expedition in 1948 spawned a whole raft (ahem!) of emulators. Some of these sought to demonstrate some scientific principle or theory of prehistoric settlement, as Heyerdahl had done, based on theories ranging from plausible to absurd. Some sought fame. William Willis apparently did it for the pure hell of it. As described in Seaworthy: Adrift with William Willis in the Golden Age of Rafting by T.R. Pearson, Willis was a nearly-rootless adventurer. Beginning as a merchant seaman, he drifted through literally dozens of jobs, wrote reams of unreadable literature, and practiced yoga and ate a macrobiotic diet decades before hardly anyone in the U.S. had heard of either. In his mid-40s, he spent over a year of appalling hardship in French Guiana on a hare-brained, but ultimately successful, plot to spring his landlady's son -- a man he had never met -- from the penal colony of Devil's Island: no special reason, but the hardship and the challenge seemed to appeal to him. It was in that vein that, at the age of 60, he decided to outdo Heyerdahl in terms of distance, self-reliance, deprivation and audacity. He traveled to Peru, built himself a balsa raft named Seven Little Sisters, and set sail alone (if you don't count the cat or the parrot), provisioned with starvation rations of ground meal, raw sugar and little else. Seven Little Sisters under sail. Willis was a curious case. Intelligent, thoughtful, and capable of careful planning, he always got tired of details before he was done with them, essentially saying to himself, "well, that may be close enough." And then, when things went wrong, he would invariably curse himself, saying "I just KNEW that was going to happen!" So when his only mainsail split wide open, he accepted it with equanimity, because he knew that he should have sailed with a spare. Ditto when most of his water supplies disappeared because they had been stored in rust-prone containers. And when he almost died in mid-ocean due to a perforated ulcer and, later, a strangulated hernia -- well, he knew these problems existed, and very consciously decided not to have them treated before embarking. He had the self-knowledge at all times to blame only himself for his hardships, and indeed, it appears that he purposely threw hardships in his own way. Perhaps there was a death wish. Perhaps he was driven to see just what kind of stuff he was made of. (He believed that he was almost supernaturally resistant to the effects of age.) Almost certainly, he enjoyed facing the challenges that such hardships presented. Willis made it to Samoa, his intended destination, wrote a book about the trip, and achieved a modest degree of fame that proved fleeting. (His book The Gods Were Kind sold less than 10,000 copies in the U.S., but when it was translated into Russian and sold as a children's book in the USSR, it moved over 100,000 copies!) But he wasn't done. More than ten years later, in his early 70s, he built another raft, which he took -- again alone -- from Peru to Australia. This was followed by three attempts to cross the Atlantic in a small, apparently not very suitable, open sailboat. The first two attempts were turned back by poor conditions and miserable progress. Willis disappeared on the third attempt, although his boat was recovered. Seaworthy (not to be confused with Linda Greenlaw's fishing memoir of the same title) is a quick, fun read and a fascinating profile of a very strange but oddly admirable individual. Author Pearson places Willis's adventures in context by describing at substantial length some of the other notable raft expeditions of the time: Heyerdahl's Kon Tiki, Alain Bombard's L'Heretique, Eric de Bisschop's two Tahiti Nui expeditions, and DeVere Baker's well-funded but ludicrous Lehi expeditions (which last sought to prove Baker's fantastic, Mormon-inspired "theory" that the western hemisphere had been settled by ancient Israelites sailing rafts across the Indian and Pacific Oceans). One might reasonably suspect that these other raft expeditions are included mainly to pad out the text, but in fact they are described in fascinating detail in their own right, and they serve the important function of holding Willis up to the mirror of his colleagues and competitiors in terms of their seamanship, their motiviations, their craft and equipment, and the nature of their achievements.